All right, news readers, this week was a busy one, so let's get right down to it. 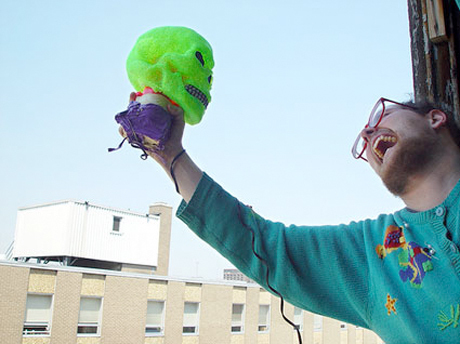 First up, Dan Deacon is mighty pissed off at you, Toronto. During his recent show in the city, someone decided to swipe the guy's beloved green skull, and on top of that, Deacon's tires were slashed. And while the tires were repaired, Deacon is still out that skull. According to the musician, if he doesn't get it back, he's blacklisting Toronto, so unless you want to ruin it for everyone, give that skull back pronto, jerk-off thief. Meanwhile, it was a big week for hip-hop news. First Erykah Badu took aim at the whole techo rap trend and then we found out some photos of Kanye West's junk are roaming the Internet. On top of that, there was the T.I. drama, which first involved the rapper talking down a would-be jumper and then the star getting slapped with an 11-month prison sentence. Oh, and there was this weird death rumour thing with Inspectah Deck. Also this week, we had Lykke Li finally announcing her return with a new single, Jack White getting his own brand of headphones and Broken Social Scene setting their sights on their next album. For a whole lot more, simply head over to our news section and get browsing.